Fever and rash (F/R) are common presentations of viral or bacterial infections in children. Viral infections associated with F/R syndromes include measles, rubella, dengue, chikungunya, parvovirus B19, human herpesvirus 6 (HHV6) and 7 (HHV7), Epstein Barr virus, cytomegalovirus, varicella zoster virus (VZV) and others. The incidence and prevalence of these infections widely vary between countries and regions, and are not yet defined in Lao PDR, where laboratory diagnostic capacities for most of these viruses are very limited. Knowledge about disease incidence and prevalence can support clinical diagnosis. In the case of VZV, clinical diagnosis is more reliable than for most of the other viral infections causing F/R. Although typically a mild disease, primary VZV infection may occasionally also be fatal, especially in neonates, the elderly and immunocompromised individuals. Infection of pregnant women can lead to congenital varicella syndrome or other birth defects in the infants. Furthermore, reactivation of latent infection and herpes zoster can be a serious and painful condition especially in the elderly. Primary VZV infections usually occur during early childhood at least in temperate climates. Some studies suggest that in tropical countries exposure and seroconversion occur less frequently and later in adolescence, leaving a significant proportion of adults, including pregnant women and even elderly susceptible to primary infection. Vaccination can significantly reduce varicella-associated disease burden and hospitalization. VZV vaccine is used in many developed countries, however, in developing countries, including Lao PDR, VZV vaccine is not part of the routine childhood vaccination program. No VZV seroprevalence data exist from the general Lao population and the epidemiology of varicella infection is uncertain, since it is not a notifiable disease. Moreover, VZV outbreaks are rarely reported as F/R disease. 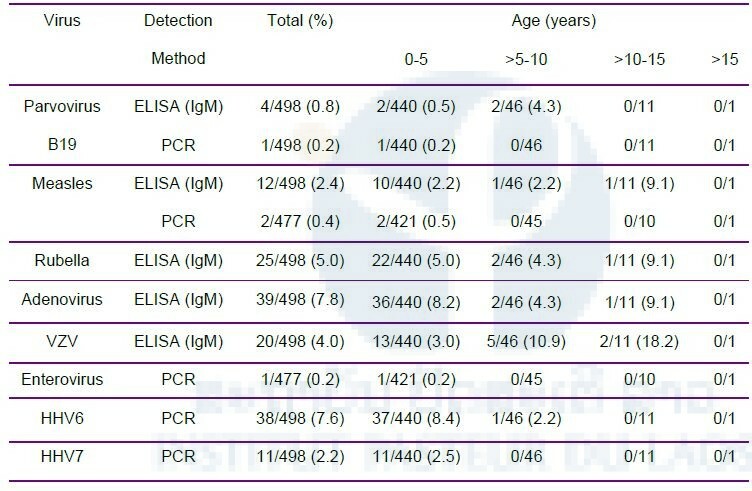 We estimated the seroprevalence of VZV (IgG ELISA) in different age cohorts (9 months to 46 years; N=3139) and investigated VZV and 6 other viruses in patients during F/R outbreaks and in an ad hoc sentinel site in the context of the national reporting system (IgM ELISA, PCR). At least 80% of the population becomes infected by VZV before adulthood, mostly during the first year of primary school. A VZV outbreak (clade 2) also occurred in the latter age group. During a dengue outbreak, 6% of suspected dengue cases had varicella. At our F/R sentinel site in a central hospital in Vientiane Capital, 14% of children with viral etiology were laboratory diagnosed as varicella and among others, a sizeable number of measles (N=12) and rubella cases (N=25) was detected compared to those reported for the whole country (N=56 and 45), highlighting nationwide a severe underreporting of these notifiable diseases. Figure 3. 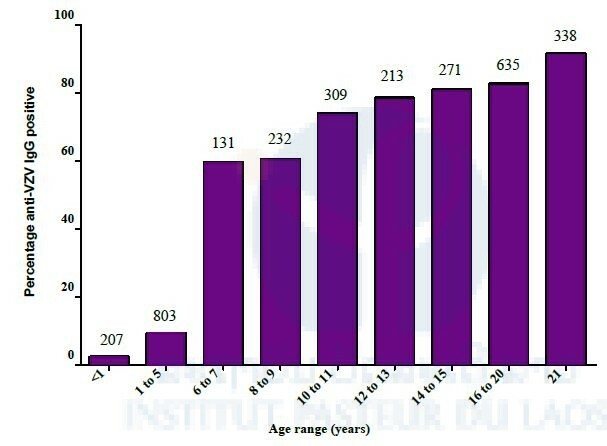 Prevalence of anti-VZV IgG in healthy Lao population by age. Numbers above the bars correspond to total participants per age-group. Table 4. 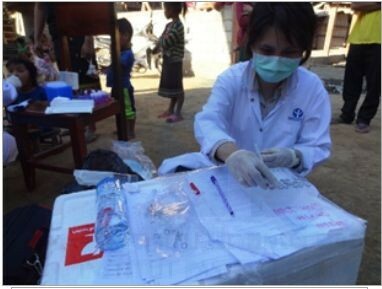 IgM and viral detection in children with F/R in Vientiane Children Hospital. Numbers indicate the positives among the samples tested. Numbers in brackets are percentages. For HHV6, HHV7 and parvovirus B19 nucleic acid detection, serum samples were used, for measles and enterovirus throat swabs. 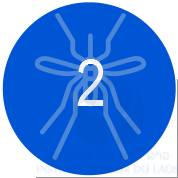 Numbers include co-detected viruses. In conclusion, we find that varicella has its highest incidence in school children and eventually affects the whole population. Nevertheless, because of competing programmes, vaccination against varicella may not be indicated for Lao PDR. Our study also warrants several recommendations. (i) Despite considerable efforts of the country to invigorate routine outreach vaccination with large supplementary immunization campaigns, our sentinel surveillance detected a sizeable number of M/R cases that would otherwise have gone unnoticed. Therefore, there is an urgent need to improve M/R surveillance and reporting. (ii) While case based surveillance must continue, even a few sentinel sites could help to monitor surveillance sensitivity to support regional elimination targets. (iii) Including varicella in the list of notifiable diseases may improve F/R and M/R reporting. (iv) Healthcare workers should be retrained in the clinical diagnosis and reporting of F/R diseases in order to increase the sensitivity and specificity of the Lao reporting system and (v) F/R diseases should be systematically laboratory investigated at least for M/R and for VZV if clinical diagnosis is unclear. These data have been submitted for publication.